Building on the experience in the WHO HIV programme, the inaugural paediatric antituberculosis drug optimization (PADO TB 1) meeting, which took place on 14 and 15 February 2019 at WHO headquarters in Geneva, aimed to establish a formal transparent process to reach evidence-based consensus among a variety of stakeholders regarding priority antituberculosis drugs and formulations for children. The meeting was attended by 45 participants, with six additional attendees participating remotely, and included representatives from NTPs from TB high burden and priority countries, clinicians, scientists, funding organizations, international organizations and technical partners. During the first day, presentations covered the size and specifics of the paediatric anti-TB drug market, the concept of paediatric antituberculosis drug optimization, experiences with antituberculosis drug development and market-shaping and the current adult and paediatric TB research and clinical trial landscape, priorities and overview of drug development. Participants engaged in discussions on the PADO for TB mechanism and modus operandi in the context of complementary efforts in paediatric drug optimization as well as the process to reach consensus on short/medium and long-term priorities for the development of paediatric antituberculosis drugs and formulations. On the second day, after providing additional background information on the PADO for HIV processes and priority list, participants broke up into three groups to discuss short/medium and long term priorities for a) treatment of drug-susceptible TB; b) treatment of drug-resistant TB; and c) treatment of latent TB infection (LTBI – both drug-susceptible [DS-TB] and drug-resistant TB [DR-TB]). A summary of the agreed priorities can be found in executive summary of the meeting report. This prioritization exercise was an important step towards development of and access to the most effective and safest medications in affordable, child-friendly formulations needed to reach the UN General Assembly High Level Meeting on TB targets for treatment and prevention in children. The Sentinel project updated their Field Handbook to provide implementation advice on the new WHO Guidelines for Multi-Drug and Rifampin-Resistant Tuberculosis (available at https://www.who.int/tb/publications/2018/WHO.2018.MDR-TB.Rx.Guidelines.prefinal.text.pdf). This Field Handbook was developed by a global team of pediatric DR-TB experts, including several Child and Adolescent TB Working Group members and aims to provide practical advice for practitioners, programmes and policy makers on how the new WHO recommendations can be used to improve treatment for children with DR-TB. For more information on the Sentinel project, visit http://sentinel-project.org/. The Child and Adolescent TB Working Group met on 24 October to share country experiences and global developments, including the recently launched Roadmap towards ending TB in children and adolescents. The focus of this annual meeting was on contact investigation and preventive therapy. The meeting was attended by over 180 participants representing a broad range of stakeholders including paediatricians, NTP managers and childhood TB focal points from the NTP, Maternal and Child Health representatives, technical and financial partners, community TB representatives, and WHO staff from headquarters, Regional and Country offices. On the eve of the 73rd UN General Assembly, UNICEF, WHO and the Stop TB Partnership hosted a side-event to show commitment and accelerate action towards ending TB in children, adolescents and families. Co-sponsored by the Permanent Mission of Japan to the United Nations, the Danish Ministry of Health, the Permanent Mission of Nigeria to the United Nations, TB Alliance, Louder Than TB, Treatment Action Group, Unitaid, the Global Fund, USAID, Elizabeth Glaser Pediatric AIDS Foundation, JHPIEGO, The Union, KNCV Tuberculosis Foundation and Every Woman Every Child, the event aimed to show commitment and accelerate action towards ending TB in children, adolescents and families. Leaders and people affected by TB discussed the importance of targeted commitments for children and adolescents. 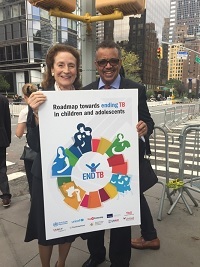 During the event the new Roadmap towards ending TB ieventn children and adolescents was launched as well as two accompanying documents: Best practices on child and adolescent TB care; and, Research priorities for paediatric tuberculosis. As of September 2018, the Child and Adolescent TB Working Group has their own logo.